Okinae is somewhat of a confusing place, at least to me. It has "Korean Restaurant" right in the title, but the name conjures up the similar and more recognizable Japanese island's name. When we first walked in, the groups at other tables were speaking Chinese, and the staff was talking with them. It turns out the restaurant is run by immigrants from the Dongbei, or "northeast," of China near the Korean border. The menu is in both Korean and Chinese, as well as some form of English. The foods here share influences from northern Chinese cooking, but are decidedly Korean in presentation. Plates of banchan are brought to the table even before you order, and the tables have a BBQ pit in the middle and a fan above. Other tables were swarmed with many sticks of BBQ and bottles of Coors Light or Budweiser, so we decided to fall into form and do the same. Since we only ordered six sticks, our grilling was done "off-site," in the front of the restaurant. I guess you need to order a certain quantity to be worth getting everything dirty, which makes sense. 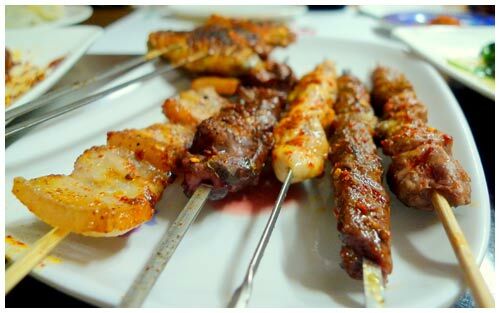 The small sticks of BBQ are all in the $1.19-$1.99 range, and all delicious. The lamb, beef heart, and pork belly stood out for us. 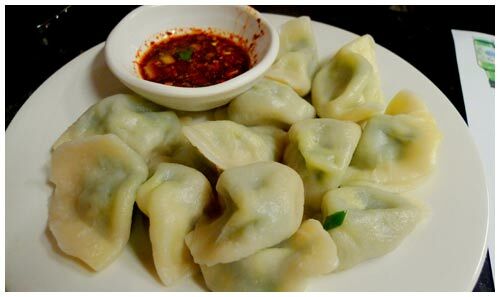 As we were munching all of our items, a nice dish of steamed chive and egg dumplings came out, on the house. Other tables received one too, so friendliness and generosity might just be the policy of Okinae. The side of chili dipping sauce that accompanies it is excellent. The main dish we went for was the cumin chicken Jane ($10.99, below), a plate full of all parts of chicken and large, well-cooked pieces of garlic. 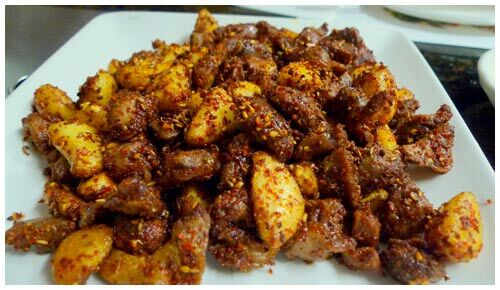 All the meat is crispy and satisfying, covered in cumin and carrying plenty of spice and seasoning. Since we had not expected the dumplings and were expecting to be full of meat, we also ordered the simple garlic spinach ($9.99, below), which is exactly what you expect. The garlic sauce makes the dish very Chinese, but it goes well to add some green to your table anyways. After we finished, we were also given a free plate of crispy shrimp chips and ordered a couple more $3 Budweisers, as there is no OB or Hite on offer here. All in all, a wonderful experience and a thorough feeling of being somewhere very foreign.